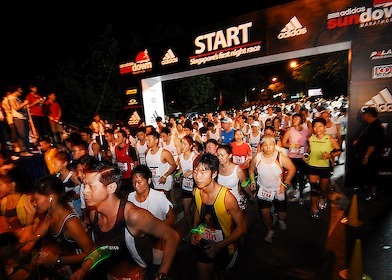 Some tips for the upcoming Adidas Sundown Marathon are, when it comes to pacing, top runners aren’t just fast-they’re also very, very consistent. Like finely calibrated metronomes, they quickly dial into a target pace and then hold it steady mile after mile. If you race, this skill is essential: Let the pace lag, and you give up time that you can’t claw back; accelerate too much, and you’ll pay for your exuberance with a late-race fade. If you run simply for fitness, a reliable sense of pace is just as valuable: Channel your inner Goldilocks – not too fast, not too slow, but just right-and you will better achieve the purpose of each workout. Of course, that’s easier said than done. The ability to run by feel is a skill that has to be learned. For example, in a study in the European Journal of Applied Physiology, researchers found that experienced collegiate runners could nail their pace to within about lO seconds per mile, while less seasoned recreational runners were off by an average of more than 40 seconds a mile. But simply running more isn’t sufficient-and neither is relying on a GPS, as you’ll never learn how to monitor internal feedback. You also have to adjust your training to fine-tune your inner pacemaker. Most beginners have very little pace sense when they first start running. To fix that, we suggest paying attention to how your pace relates to your sense of effort. Which paces feel easy, medium, and hard? By focusing on cues like your breathing, the rhythm of your legs, and the motion of your arms, you’ll ingrain the physical sensations that correspond to different speeds. Twice a week, time a mile in the middle of an easy run. Don’t speed up or slow down-the goal is to just gather information to gradually calibrate your internal speedometer. In your log, note your time and an effort rating on a scale of 1 to 10, along with brief comments on how your breathing and legs felt. After a few weeks, do the same thing during tempo runs to fine-tune your faster pace. Then try timing miles near the beginning and end of workouts to learn the difference between, say, tempo or goal race pace on tired legs and fresh legs. Spend at least a month in this awareness-building phase. Some runners depend exclusively on their watches to tell them their speed. “Instead of relying on a sense of pace, they turn to the Garmin every 15 seconds and run like they’re in stop-and-go traffic. Once you’re familiar with your split times during certain runs, start trying to guess your time for those sections-before you look at your watch. Initially, you may be a minute or more off per mile, but you’ll get better. It takes about six months of strict attention to feeling pace to consistently get within 10 seconds a mile of your goal pace. To be able to call up any given pace on demand, the final step is to practice shifting back and forth between paces. “A lot of times people are great at hitting a certain pace, but only if they can lock into it and stay there. But in the real world, hills, sharp turns, or crowds can break your rhythm. Running work-outs that call for frequent pace changes will help you quickly resume your desired pace after a disruption. The simplest exercise is to shift back and forth between two speeds. For example, alternate between 800 meters (or a half-mile) at tempo pace and 800 meters at one minute per mile slower than tempo pace for two to four miles. Initially, check your watch every 400 meters to ensure you’re hitting the proper speed. Then check every 800 meters. Use this exercise for all your training paces. Some years ago I met a patient; Mr Chan Meng Hui. Having heard some of Mr Chan Meng Hui’s extraordinary stories, I have seen that there is more to this man than his passion about running. It is ultimately about overcoming the odds, and going through adversity while staying true to yourself. It is about hope and love for his fellow man, and letting one’s light shine and sharing it with the world. It is about an ordinary man who has achieved extraordinary things – all by the power of the will. The fact that Mr Chan did not start running until he was 55 years old, and that to date he has completed 87 marathons not to mentions runs of various other distances including a 100 km trek through Mongolia (despite the risk of running in the dark, he managed to complete 66 km), made me feel extremely humbled. The fact that he is still running marathons at the age of 81 is just awesome. Being part of a growing group of middle aged individuals who have taken up endurance sports at a relatively late stage in our lives, I can just about to appreciate what he has gone through to make it to where he is now with all those amazing achievements under his belt. Someone once said that the longest distance in endurance races is the space between your two temples – the limiting factor in most people’s lives is the willpower (or lack of ) to get out of your comfort zone (and your comfortable chairs) and start putting one foot in front of the other. Mr Chan feels strongly that if he can do it, anyone else can. As he is often asked how he has been able to achieve so much and how he got started, he tells everyone how he could barely run 100m when he first started. And his book is to inspire others to push themselves beyond their own perceived limits. In doing so, they will discover a whole new person underneath.